One of my first findings as a wedding photographer was to deliver a large variety of images from the big day. I love capturing moments between the bride and groom during the day, then having a quick photo shoot minutes before the sunset, and finally taking five minutes during the reception for a night photo shoot. In addition to the ceremony and reception, which are generally indoor events in the greater Toronto area, the outdoors images taken at different times of the day provide the bride and groom a beautiful collection of the images captured in various lighting situation and scenarios. 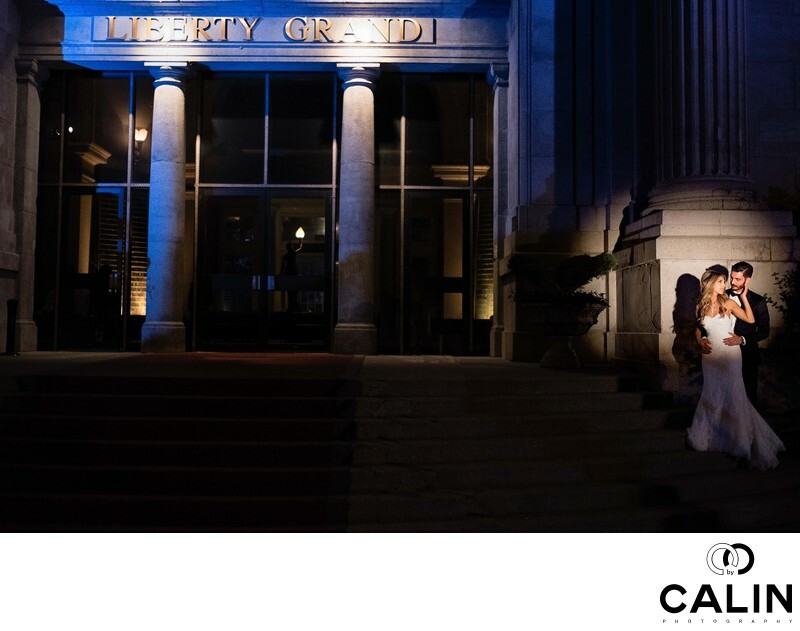 At this Liberty Grand wedding I made sure that the bride and groom were formed and ready for quick photo session towards the end of the big day. As such, myself and the second shooter scouted the environment and found a few spots that would give us a beautiful variety of environmental portraits. This romantic portrait of the bride and groom was captured in front of the main entrance by the dome. It might sound incredible, but to create this beautiful wedding photo it took two photographers about two minutes. Once we pre-visualized the final image in our head it was a matter of execution and with the help of a continuous light source we were able to pull this off in no time at all. In general, my clients appreciate when they don't get to spend more than five minutes outside during the wedding reception. After all who wants to leave the party to take a lot of pictures outside while the friends, the family and the guests are on the dance floor?